"The Tale of Despereaux" is the first feature animation created by Framestore, for Universal Studios as producer. On this show I was responsible for development and application of character body deformation system, which would produce artistically and anatomically correct behavior of skin and clothes as characters are animated. This system was applied on all characters in the movie, including humans, mice, rats and crowds. Once upon a time, in the faraway kingdom of Dor, there was magic in the air, raucous laughter aplenty and gallons of mouth-watering soup. But a terrible accident left the king broken-hearted, the princess filled with longing and the townsfolk despondent. All hope was lost in a land where sunlight disappeared and the world became dreary gray. Until Despereaux Tilling was born... A brave and virtuous mouse, Despereaux is simply too big for his small world. 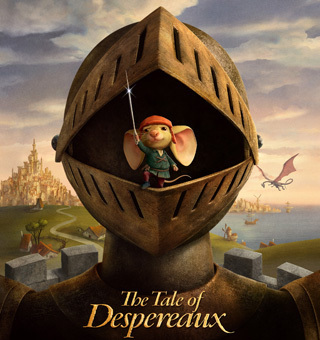 Though tiny, wheezy and saddled with comically oversized ears, Despereaux refuses to live a life of weakness and fear...believing he was destined to be celebrated in the tales of chivalry he so adores. When he's banished from his home for not following the rules that society expects of a mouse, Despereaux befriends fellow outcast Roscuro, a good-hearted rat who can't bear to look in the mirror and hopes to live far from the grim underground of his kind. While Despereaux begins his noble quest to rescue Pea--a princess who can't see beyond her distorted view of the world--his pal Roscuro receives a painful rejection from her highness that sets him on a course of self-destruction.